The glitzy West End restaurant and cocktail bar Circus, found in the heart of London’s atmospheric Covent Garden, dishes up modern Pan-Asian cuisine. It is famous for its unique dinner entertainment – circus acts and cabaret, of course. The exciting range of acts entertain every half an hour or so, which mean if you arrive at the recommended time of 7:00pm, you can catch roughly around four acts. For me, this was the perfect amount to keep me entertained. 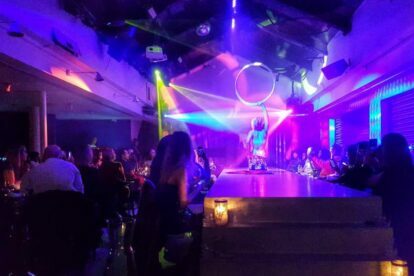 Expect the likes of glitter-clad showgirls writhing from hanging ropes, to shirtless male performers dancing gracefully through suspended hoops! Between the acts, the food also boded extremely well and I was particularly impressed with the fish options on the menu. I adored the crispy red prawn tempura, dipped into zesty lime ponzu sauce and the teriyaki salmon served with mustard, red onion and ginger, the succulent slices coated with a sweet, sticky sauce. Bear in mind that dinner with such entertainment comes with a bit of a price; I would recommend an evening here for a special occasion or for someone seeking a more unusual dining experience whilst visiting London.